On 21 September 2017 a Grain SA member, Wilmar Adams, a 37-year old farmer from Suurbraak in the Southern Cape, received the award as the SAB’s Emerging Barley Producer of the Year. 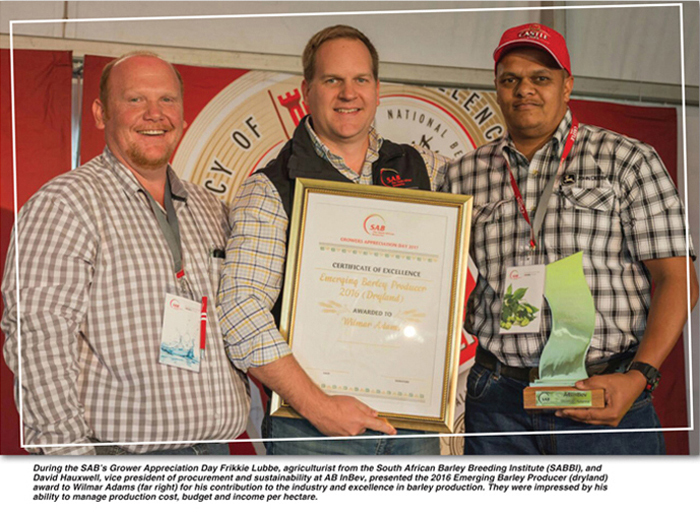 The award was presented to him during the Grower’s Appreciation Day held at the SAB Barley Farm in Caledon. The event was held by the South African Breweries (SAB) and AB InBev to show their commitment to grow and develop the South African agricultural sector. Suurbraak is a small town in the Overberg District Municipality in the Western Cape. The village was founded in 1812, when the London Missionary Society established a mission station there. This area is close to Wilmar’s heart as it is here where his father, Eddie, introduced him to farming. 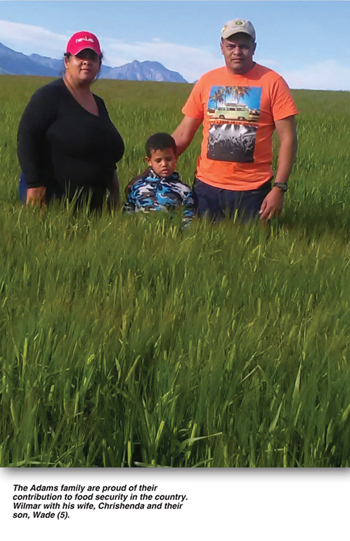 He grew up in the area – the youngest of three children – and now farms on approximately 300 hectares of communal land which he rents from the local municipality. Mahatma Ghandi, leader of the Indian independence movement, said: ‘The future depends on what we do in the present’. Conservation agricultural is proof of this and Wilmar firmly believes in the advantages thereof. 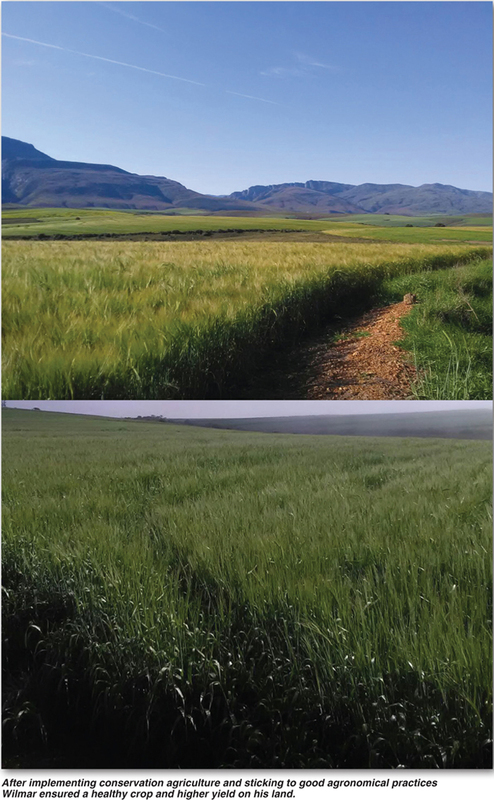 It has not only helped to reduce soil erosion and increase water conservation, but has made a noticeable difference in his yield. In the past four years his average grain yield has increased from 1,4 ton/ha to 3,6 tons/ha. He shares that his father often said, ‘A farmer is not made, he is born. A man cannot just decide one day that he is going to farm. If you want to take chances in life, farming is definitely not the place to do it.’ He knew, therefore, that there was only one way to do things and that was the right way. As a result of poor farming practices on the communal land Wilmar had to first correct the imbalances in the soil to improve the soil fertility after taking over the farming activities from his father, Eddie, who passed away a few years ago. Lime was applied to correct the pH of the soil and attempts were made to save the moisture by improving the stubble cover. Today he cultivates barley, wheat, oats and canola in a crop rotation system. Rota­tions are adapted according to yield and seasons and are flexible enough to accommodate changes and challenges as they arise. In the 2016 season he managed to produce a barley yield of 3,6 ton/ha. With a drier 2017 season with a rainfall of only 102 mm during the planting season he still delivered a 3 ton/ha crop. 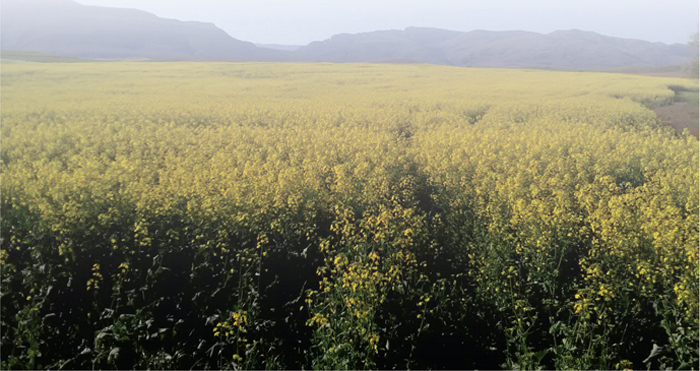 Canola is delivered to the canola plant, Soill in Swellendam, while harvested grain is delivered to Sentraal-Suid Koöperasie (SSK) of which he is a member – an agricultural cooperative founded in 1931 by farmers in the Overberg region of South Africa. Marketing is done through a company which specialises in grain marketing. For the past six years Wilmar has also been employing no tillage on the lands, reducing erosion and the loss of soil moisture. He says that this practise positively impacts the microorganisms in the soil, essential to supporting a good crop. It has helped reduce cost with a reduction in the amount of fertiliser needed and has lowered fuel consumption. On time: Farmers need to do things on time. If it is necessary to apply pesticide, don’t delay. This makes the difference between an average farmer and a great farmer. At standard: Production practices must be carried out correctly the first time and no short cuts should be taken. No wastage: Wasting water, seed or products is throwing money in the water. With joy: Love what you do or don’t do it. 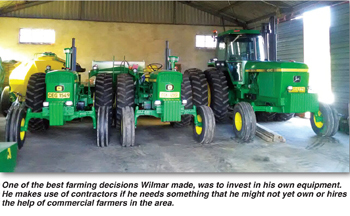 According to Dirk van Papendorp who was one of his mentors for a few years, Wilmar’ success is a combination of hard work and excellent agronomical practices. Dirk was so impressed by this determined passionate farmer that he nominated him for the National LandCare Conference Best Conservation Agriculture: Advanced Smallholder award. He is positive about the future of agriculture in South Africa and says emerging farmers must work hard and trust in God to be successful. To young and emerging farmers, he has the following advice: ‘If you want to farm, go for it, do not doubt yourself. But if you do it, do it with passion’. He would love to acquire more land, but this is not possible in his current location. Arable land in the Suurbraak area is limited and has to be divided amongst the residents there. With many still waiting for a piece of land, he knows his chances of expanding there are slim. He dreams of farming on his own land, but with the price of commercial agricultural land this dream seems out of reach. ‘Without assistance from the state it is impossible for emerging farmers to acquire land. If there is one quote that Wilmar fully agrees with it is: ‘Success is not the key to happiness. Happiness is the key to success, because if you love what you are doing, you will be successful’. ‘To me what I do, is not work, nor is it a hobby, it is my passion,’ he says. He loves the variation of the farming industry where not one day is the same as the next. ‘There is no monotony on a farm,’ he says. He loves what he does and when the Adams family has a chance Wilmar likes to take them to visit farms to learn from other farmers and to see what impact different agricultural practices have on the crops. The famous professional American basketball player, Michael Jordan, said about success: ‘Some people want it to happen, some wish it would happen, others make it happen.’ Wilmar is someone who wanted it to happen, wished it would happen and ultimately made it happen. With his determination, the dream of owning his own land one day will one day become a reality. Article submitted by Louise Kunz, Pula Imvula contributor. For more information, send an email to louise@infoworks.biz.